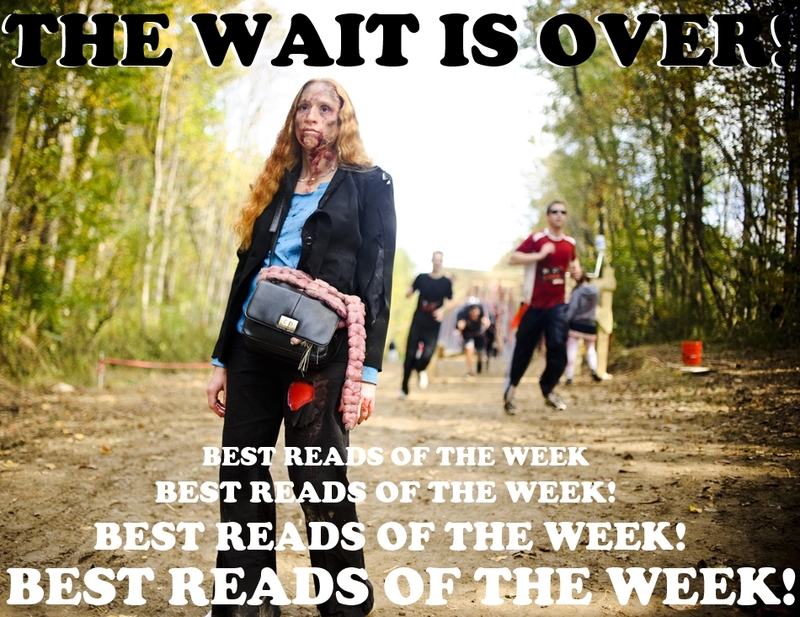 DYVERS: Best Reads of the Week! May 10 - 16, 2014! Welcome back to the Best Reads of the Week! I read three hundred blogs and search through the Google+ Pen and Paper Bloggers community for the best articles being put out by this hobby every week. This week was filled with great advice for Game Masters new and old as we saw ways to maintain and build tension during our games from all corners of the blog-o-sphere! We've also got new monsters, fantastic tables, cursed items, and new ways to do hexcrawls! As always, these guys and gals spend a lot of time working on their blogs and if you like one of the posts these fine authors have published be sure and let them know by giving the post a +1, a like, or a comment! d100 Megalith Sites - Remains of the Old Ways by +Chris Tamm, from the blog Elfmaids & Octopi: If ever there was someone involved in this hobby who can make me love d100 tables it's the remarkable and inventive Konsumterra. In this latest installment from his d100 series of charts Konsumterra provides his readers with two interconnected d12 charts that could provide any Dungeon Master with a quick framework for megalith sites that players might run across in the wilds. Then he follows this up with a fantastic d100 table of megalith sites on his Exile Island. Pathfinder & Cthulhu Team Up to Beat D&D by Digital Orc, from the blog Digital Orc: In this interesting article from Digital Orc an analysis of scheduled games being played at this year's GenCon are discussed. While the latest edition of Dungeons and Dragons has yet to be formally announced I would love to see how the scheduled games adjust once it has been. Sword of Stone and Blood (A Rare Cursed Item from My AD&D Game) by +Mark Van Vlack, from the blog Dust_Pan_Games: I love cursed items and this one presented by Mark Van Vlack is just so much fun. It's got built in story elements, thoughts on how to use it, and it just screams out to be put in my games. The Octaros by +Arnold K., from the blog Goblin Punch: While Arnold K. describes this post as a riddle I call it the sort of nightmare fuel that drives me to pull my hair out in frustration as I wonder how he can be so effortlessly creative. Without spoiling anything this is a must read post. Hexcrawling so Travel and Exploration Earns EXP by JDJarvis, from the blog Aeons and Augauries: There comes a point when traversing the innumerable hexes that populate every Dungeon Master's world needs more than just the everyday humdrum. That's where this insightful post from JDJarvis comes in to provide you with a different way to think about running a hexcrawl. Tales from the Table - Building Tension Part I and Part II by +Rick Stump, from the blog Don't Split the Party: This two part series of posts on building tension in a session are outstanding. Rick is able to provide you with some concrete examples of how to make your sessions memorable by building the tension of the session. Well worth reading for old hats and new hands. Cautious Advance by +Douglas Cole, from the blog Gaming Ballistic: In this clever post by Douglas Cole we find the author working his way through the problem of maintaining tension during combat. Like so many of us he's dealt with the difficult nature of shifting from player to player while the bad guys lurk just off screen and he's come up with an interesting solution. Dragging it Out for Drama by +John Stater, from the blog The Land of Nod: So often in our hobby we neglect the slow build and instead go for the immediate gratification of a one and done effect, but we're missing out on an opportunity to provide our players with something more meaningful when we do. In this article by John Stater we're shown a better way. Adventure Background - Who Needs It? by +Mark Knights, from the blog The Pathfinder Chronicles: We've all got books, modules, and pdfs filling our shelves and hard drives with countless pages of expository background. But do you really need it? Mark Knights has some thoughts on this issue. Reading Points of Light by Nick "dither" Foster, from the blog Rumors of War: In this article by Nick Foster more questions are raised than answered - and that's a good thing, because this post is the sort of thing you need to read. It reminds you that the narratives you've played in over the years aren't the end of where you can go, but the beginning. You can discard everything and be better for it. If You're Going to Be Evil . . . from Poot's Perspective by +James Frost, from the blog The Poot Perception: A companion piece to my If You're Going to Be Evil series created by my long time co-conspirator. The story is told from his perspective and has been one of my favorite series to read of late. The link for his series begins with the first post, hope you all enjoy it as much as I have. The Problem with Your Theory Begins with You Opening Your Mouth: Arguing on the internet can be a real drag and hasn't advanced very much in the last decade. So why do we keep falling in the same pitfalls? And what's going on down in the comments on this post?